Based on the Friends and Heroes Episode 1 LONG JOURNEY. I received a free copy to review with my family. It is a privilege to review this quality product and make this recommendation. Bible Study: Daniel and the LIon's Den, The Miraculous Catch of Fish and the Early Church. This first Unit (there is an entire series, with 13 units per series) follow Macky and the friends of Jesus in a study the entire family can enjoy. There is a special promotion you don't want to miss! The Student Manual is self-guided. Yep, self-guided. You child can begin on the lesson as needed after the video has been viewed. It's not Mom dependent. A BIG plus! The Student Manual is colorful and beautifully laid out. It's in .pdf format, easily printable. Each Student Manual is about 50 pages. If you're a larger homeschooling family, no worries. Each book can be downloaded multiple times to enable use among multiple children or over many school years. That's another BIG plus! The Teacher's Guide is straightforward. It provides the cross-curriculum information (how to weave in the other subjects, such as History, Geography, Science, Creative Writing, Bible Study, or Artistic Expression) right where it is most helpful. The Teacher's Guide contains internet links and other background information to support your teaching efforts. Key Points for your children to master are clearly outlined. Learning Goals are outlined as well. The DVD show. My kids ages 4 1/2 to 13 were fully engaged. They were able to tell me the story line including the bible lesson in the episode. My four and a half year old understood the story of Daniel and the Lions den which reinforced a Sunday School lesson from a previous week. 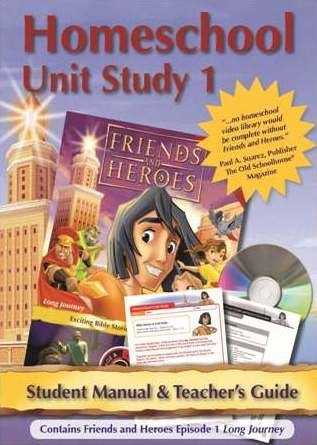 If you're looking for an affordable, fun, colorful unit study for your family, based upon a Christian Worldview, you will enjoy the ease of teaching with Friends and Heroes, Unit Study 1. Designed for students aged 7 to 11. The colorful lay-out of the Student Manual, along with just enough writing to challenge a 7 year old, while an older student could add more to the curriculum with the suggested cross-subject suggestions. This is why Unit Studies are so great! Covers all your subjects except for Grammar and Math. And if you're the creative type, you could easily work those in! Each Unit Study covers 2 to 4 weeks of learning, depending upon the age of the student and the particular homeschooling method or scheduling of the family. The DVD really does take the pressure of Mom to teach "all things." Mom can watch along and then use the Teacher's Manual to round things out.